A successful scientist is also an entrepreneur. For emerging regenerative medicine (RM) companies and researchers such as Rebecca Lim – this is no revelation. Understanding the importance of translation and commercialisation of innovation isn’t difficult. For academics, the challenging part is how to approach and implement such strategies. Dr Rebecca Lim, stem cell researcher at The Hudson Institute of Medical Research and recent CCRM Australia member, knows this challenge all too well. Transitioning from a solely academic world to that of commercialisation, Rebecca is a strong advocate for entrepreneurship, fuelled by her recent experiences within the industry. Having secured up to $5m in funding since 2010 and attracting investor attention at the recent BIO SPARK conference, Rebecca sees commercialisation as a fundamental launching pad to her career as an academic entrepreneur. 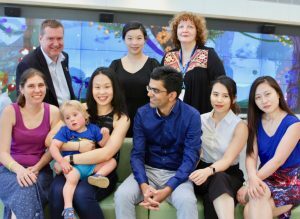 Rebecca Lim, second from lower left, along with her team (clinical and research) with the first baby, Caiden (whom Rebecca is holding) to ever receive allogeneic amniotic epithelial cells. Caiden, now breathing on his own is no longer reliant on oxygen supplementation. His treatment reflects 10 years of vigorous research. Dr Rebecca Lim began her research career after graduating from The University of Western Australia with a PhD. Today, she holds the position of deputy head at the Ritchie Centre where she leads the Regenerative Medicine and Cellular Therapies Theme. There, she works with a dedicated team, understanding the regenerative potential of amniotic epithelial cells in repairing the damaged lungs of neonatal babies. Her most recent studies investigate the regenerative potential of stem cell derived exosomes. Exosomes, BIO SPARK conference and CCRM Australia. Rebecca received an invitation to present her work at the Stanford University BIO SPARK showcase in San Francisco in 2016. The opportunity allowed her to showcase her research, readying it for partnering or venture funding. There, she was to given 15 minutes to present her research on exosomes as a commercial alternative to stem cell therapy. “My transition from academia to industry came purely from serendipitous findings that had commercial potential” commented Rebecca. The experience from Bio Spark – in which she received tremendously positive reception – opened her eyes to the importance of global networking and the commercialisation of innovative research ideas. It also put her in touch with a broad network of research scientists. “This field is not advancing as quickly as it could. The two biggest issues facing the RM Industry are the general lack of understanding from academics about commercialisation of their work and industry members that exploit regulatory compliance loopholes. Cowboy outfits have been allowed to proliferate. This sort of activity could lose trust of the public in this otherwise promising sector.” commented Rebecca. 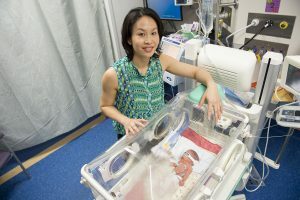 Rebecca Lim at Monash Newborn’s neonatal ICU shows the importance of regenerative medicine. At this age, they can’t breathe on their own and rely on steroids (to mature their lungs) and respirators to keep their oxygen levels up. Organisations such as CCRM Australia can help tackle these challenges within the industry and support researchers like Rebecca via its valuable industry networks and strong commercial position within the market. In her formative time at CCRM, Rebecca has been meeting and networking with others in the field. “Regenerative medicine research can’t afford to be local, it has to be global.” said Rebecca. Armed with new insight and skills that her time with CCRM has afforded her, she now plans to branch out with a new venture of her own. This new direction is still in its early stages, so watch this space.